Jurassic Park continues to assume its gory, gruesome mantle at the box office. This third incarnation (rather reminiscent of the Jaws saga) features some suitably machinating music that sometimes sounds like the engine in your proverbial backyard! There is a considerable lack of melody throughout and the music at times just disintegrates into a whole series of sounds and crashing hullabaloos featuring the great monsters having a go at all they can find. It is obvious that the music on its own is a considerable detriment as the filmic scenes are of crucial importance if one is to understand what is going on. The multimedia spectacular that accompanies the disc is definitely an essential part of the package. I do not always agree with such audio visual presentations but I must admit that this show is particularly impressive. 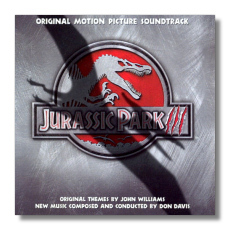 If you are into such technology, this soundtrack will definitely appeal, especially if you are into Spielberg's magnificent use of colour and sound.